Perfect dogs are only a little less rare than perfect humans. That's why when we use the P-word, you can believe it! Butters is the very embodiment of canine perfection. Found wandering the mean streets of Compton, life couldn't have been a bowl of cherries for this pink-nosed pup with the plain yogurt complexion. 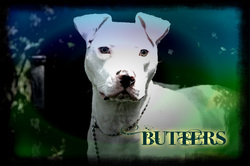 Despite all odds though Butters has impeccable social skills, with a special knack for charming dogs and humans alike. Butters could be the missing ingredient in your active family recipe.